Last week, Yahoo announced on its Y! 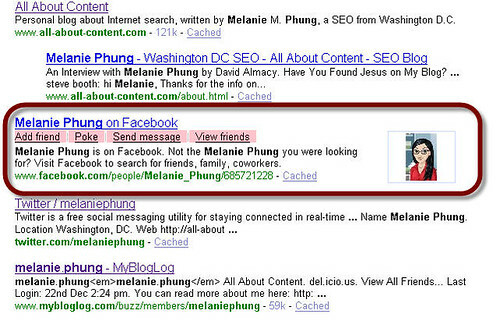 Search Blog that publishers can now embed multimedia content directly into the search results. Had Google announced such a move, it would have been impossible to avoid the buzz. But since its “only Yahoo”, I didn’t see any mention of this latest Enhanced Results innovation — even though it looks wicked cool! Basically, by adding a small bit of markup around an embedded object in your web page, you enable Yahoo “to extract the necessary structured data to display it as an enhanced result”. The enhanced result is first displayed as a thumbnail next to your search result; if your embed object is a video, then when a searcher “click[s] on the thumbnail image, an expanded video drops down so they can watch the video clip directly on the search results page. This works for videos and will soon work for games and other documents … apparently it also works with something called Facebook Share markup. If it’s been a while since you’ve used Yahoo for search, you may be surprised that Yahoo has been rolling out enhanced results for all sorts of things. In other words, this isn’t just for tricked out multimedia content like Hulu videos (the example used on the above Yahoo Search blog). Simple things like images and internal anchor links could be displayed as enhanced results. Although Yahoo is handpicking which sites get this special treatment for now, the blog does encourage publishers to use the mark up so Yahoo can crawl it as soon as possible. Clicking on these Facebook shortcut links just sends me to a login page. Terrible usability, but I still bet that enhanced listing will get more clicks than the surrounding results. Obviously there are a questions: How many sites will eventually get to have enhanced listings? Will too much of this make the Yahoo SERPs look cluttered? Will embedding multimedia content in the SERPs cause users not to visit the hosting page, thus impacting page views? While Google’s stranglehold on market share is not likely to be upset by Yahoo’s latest SERP enhancements, I do find it exciting to see this kind of product improvement by the second biggest search engine — features aimed at helping users, not simply getting more user data or serving up more ads in more places. More developments in the Microsoft/Yahoo will they or won’t they story: MSFT is proposing to buy YHOO shares at $31 per share, for a total equity value of over $44.5 billion. A combined Microsoft-Yahoo force might actually have the muscle to at least play in the same league as Google. (I’m so annoyed that I had already sold my Yahoo stock!) However, as SEO Hack points out, in a sentiment shared by many, that partnership would be like a giant retarded gorilla sitting on a flattened baby chicken. REDMOND, Wash., Feb. 1, 2008 — Microsoft Corp.
(Nasdaq: MSFT) today announced that it has made a proposal to the Yahoo! representing a total equity value of approximately $44.6 billion. 62 percent premium above the closing price of Yahoo! common stock on Jan.
services market,” said Steve Ballmer, chief executive officer of Microsoft. billion in annual synergy for the combined entity. Yahoo! engineers, key leaders and employees across all disciplines. would be completed in the second half of calendar year 2008.
proposal, Microsoft would acquire all of the outstanding shares of Yahoo! exchanged for shares of Microsoft common stock and one-half of the Yahoo! proposal is not subject to any financing condition. Our proposal represents a 62% premium above the closing price of Yahoo! compelling value realization event for your shareholders. during the last three year period, significantly outperforming the S&P 500. Vista, and other strategic initiatives. were based on a vision that the online businesses of Microsoft and Yahoo! that the only alternative now is the combination of Microsoft and Yahoo! meet with your counsel at their earliest convenience. agreement to you and begin discussions immediately. to publicly release the text of this letter tomorrow morning. available to meet with you and your Board at your earliest convenience. enthusiasm, and we look forward to a prompt and favorable reply. This week’s weather, according to the Yahoo Search blog. Check to see if a rankings shift is in your forecast. According to the Yahoo Search Blog, Yahoo rolled out an update to their search index and ranking algorithm over the weekend. Time to go check the rankings. Nielsen//NetRatings today reported its market share data for the top 10 search engines. Google, no surprise, continues to lead with Nielsen NetRatings reporting 4.03 billion searches having been conducted on Google last month. That translates to nearly 45% year over year growth and 56.3% of total U.S. market share. Yahoo Search is in second place with a little over 1.5 billion searches and 21.5% of the total. MSN trails a distant third with only 8.4% of all U.S. searches conducted on the Windows Live search engine. Rounding out the top 5 search engines are AOL Search and Ask.com, with 5.3% and 2.5% of search market share, respectively. At the bottom of the list is the search aggregator Dogpile, which saw fewer net searches than the previous year, with year over year growth a -10.6%. HitWise, a competing market research firm, also released its May search data today. According to HitWise, in May Google captured a whopping 65.1% of all U.S. searches, up from 59.3% last year. The number of searches attributed by HitWise to Yahoo are in line with Nielsen’s data: 20.9%, a figure that’s down slightly from May 2006. And MSN/Live Search garnered 8.4% of searches, down from 12.1% of marketshare 12 months prior. Ask.com fared a little better based on HitWise data, with 3.9% of the market compared to 2.5% that Nielsen reported. Either way, IAC’s Ask.com continues to lose market share to the bigger players.